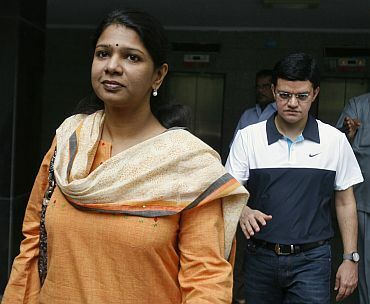 Ahead of the April 18 Lok Sabha polls, election officials on Tuesday held searches at the residence of Dravida Munnetra Kazhagam leader Kanimozhi in Tuticorin in south Tamil Nadu from where she is contesting. Official sources indicated that the searches were held following 'some inputs', but they did not elaborate. Income Tax officials were also 'assisting', the local poll officials, they told PTI. The outcome of the searches were not known immediately. Following information about the searches, a large number of Dravida Munnetra Kazhagam workers gathered in front of Kanimozhi's house expressing solidarity. DMK president M K Stalin in a statement at Chennai said the raids were an outcome of 'fear of a damning defeat', for Bharatiya Janata Party's candidate Tamilisai Soundararajan in Tuticorin.